I fall asleep on the way to Yinchuan from Beijing, looking out at a barren landscape and winding roads, built for ends I cannot quite see even from up above. When I wake up, my neighbour is looking down into the empty shells on his plastic tray with the sort of gratitude only an in-flight meal makes possible—happiness at having been served food, and relief that the ordeal is over. When my tray appears in front of me, it contains a pale, steamed bun, and to me seems remarkable even before I get a taste of the shredded meat stuffing inside. On the bun’s clear plastic wrapping is a tiny sticker saying, “Moslem meal". It is the first discernible sign that I am travelling to an area in China where a third of the population follows Islam, a statistic that the appearance of my co-passengers does not let on. I am struck by the absence of visible markers of identity because there is much at stake in being a visible minority in the country. Like many things that command my attention, this observation is evidently rooted in my own reality in India, but I am eager to reformulate my understanding of the question in another place. I already know that the Chinese government has recently embarked on a mission of Sinicization of Yinchuan’s landscape. Domes and signs in Arabic script, which were promoted a decade ago to lure tourists and investment from West Asia, are being removed from both secular and religious buildings in haste. Arabic classes, run by mosques and private institutions, have been halted, and when a newly built mosque is slated to be demolished in the province without a clear reason, protests erupt. The region’s Mandarin-speaking Hui Muslim minority, mainly descendants of traders using the silk road, who have not faced extensive persecution like the Uyghurs, are thus feeling threatened. The official policy towards the Hui has now become deeply contradictory. 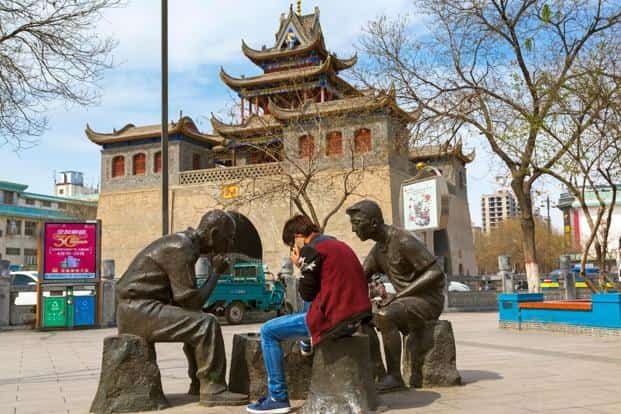 The government sees Yinchuan as an important stop on its Belt and Road Initiative—a reinvention of the ancient mercantile route—and, to this end, has even built a Hui culture park on the outskirts of the city, complete with a replica of the Taj Mahal. Signs of this rapid development are everywhere in Yinchuan, in its rows of identical high-rises that seem largely uninhabited and its neat urban layout with uniform trees. Whatever existed before has been cleared for glitzy buildings; so much so that when I enter the regional history museum, I am not sure whether I have mistaken the address and ended up in a mall. The room dedicated to narrating the story of the establishment of communism insists on fraternity. At the entrance, one of the sculptures of the foot soldiers of the revolution is presented with a skull cap and a moustache. The entire display, with dioramas featuring bearded men and veiled women, who support Mao and denounce the traitors among them, pushes for a successful integration of difference. Yet, the government seems to be panicking now. On the surface of Yinchuan, this tension is not apparent. Instead, the culture of the Hui is dispersed across the city in the form of restaurants and food carts that sell qing zhen or halal fare advertised in green lettering alongside a logo featuring domes and minarets. The most visible Hui, those who wear the attire associated with the community, are few but mostly to be seen behind the counters of these establishments. It is a version of the appropriation of minority culture found in different forms in different parts of the world. Yet, it is not surprising that Hui cuisine—or the adaptation of it for the public—is so popular. 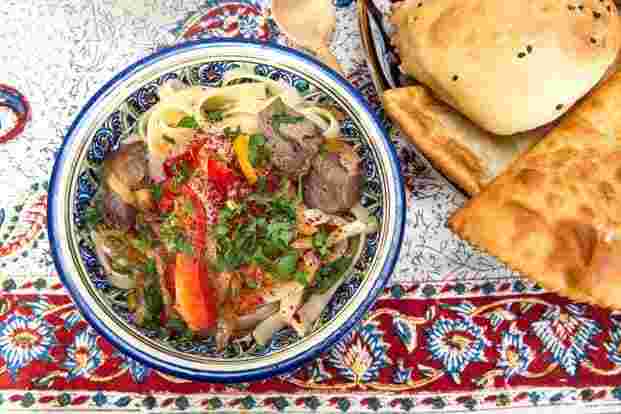 The principle dish, la mian or hand-pulled noodles served with broth, meat and vegetables, can take infinite variations. Going by the pictures displayed in restaurants, one might think that the choice of meat or level of spice is critical, but after having tried a few combinations, it becomes evident to me that a good bowl of la mian doesn’t reveal itself quite so easily. The best chefs are those who succeed in getting the noodles right, i.e. in kneading the dough until it becomes supple, stretching it to adequate thickness, and then boiling it just enough so that it is tender when slurped up. You have to hope you’ve stumbled on cooks up to the task; controlling the choice of meat, whether beef or mutton, and the amount of spice in the form of ground chilli and pieces of red pepper, is easy enough. In the city centre on Xinhua street in Xingqing Qu, where the southern gate provides an imperial backdrop to a pedestrian complex of high-street fashion outlets, Hui cuisine takes the form of barbecued meat on sticks. The largest cluster of such stalls is in an alley behind the city’s Nanguan mosque, a couple of kilometres away. Despite specializing in halal, most of the restaurants, to my surprise, serve beer and the green domes overlook diners feasting on crisp and spicy preparations. The mosque itself could be a transplant from Mohammed Ali Road in Mumbai. Men and women are gathered at separate tables waiting for the sun to set in order to break fast. It is Ramzan. There are watermelon slices, dates and steamed buns lying untouched and there’s still light in the sky as swallows circle above. I visit the prayer hall and linger in the courtyard, where some women invite me to join their feast. We have no language in common so communication takes place in the way that it has with all strangers in Yinchuan. They speak into a translation app on their phones, and I speak back, but the technology is imperfect and the questions we ask each other are not always comprehensible. When the light fades, a sharp siren serves as a call to prayer, which is followed by a meal of hand-pulled noodles in mutton and broth eaten so hurriedly I am hardly able to keep pace. President Xi Jinping watches over us from a poster nearby. 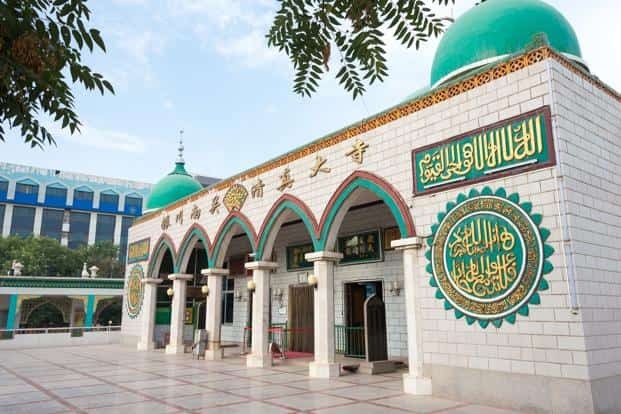 The mosque’s architecture is a product of reconstruction during the 1980s following a period of dismantling and destruction of places of worship, or any others signs of tradition, during the Cultural Revolution. The sense of familiarity that the building and the rituals evoke in me are nevertheless diminished by the lack of a profound exchange with the people I meet. I realize then that the form of the mosque is not foreign to China; it is me who is a foreigner. This dissonance is instructive: the things that we term as “ours", the things that we want to preserve out of a sense of attachment, may come from elsewhere, but they accrue history and memory and are therefore transformed by it. After all, the mosque, no matter what it looks like, is Hui and by association also Chinese. On my last day in Yinchuan, I decide to take a taxi west, roughly 30km out, to see the excavated remains of mausoleums of rulers of the Xi Xia dynasty, a Buddhist empire that ruled the region from the 11-13th centuries. The tombs, shaped like pyramids, rise against the foothills of the Helan mountains. The Xi Xia kingdom came to a brutal end after Genghis Khan’s army launched a campaign in 1227. Genghis Khan himself died in Yinchuan during the battle. The mausoleums, which hide more than they reveal, make me think about a future in which mosques like Nanguan might themselves become ruins and will be required to be explained and presented to its visitors. Despite the gloomy tenor of this thought, I realize that it is, in fact, quite an optimistic idea because it is based on the presumption that mosques will not be completely destroyed and effaced by the government in the coming years.